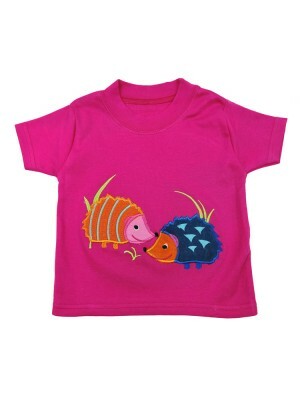 A lovely soft cerise cotton t-shirt with 2 colourful and cute hedgehogs on the front. 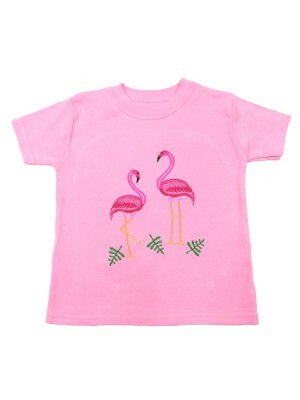 Fabric Content – 100% Cotton T-Shirt Garment Care - Cool machine wash. Avoid ironing applique ..
A lovely soft cotton t-shirt with 2 pink flamingos on the front. 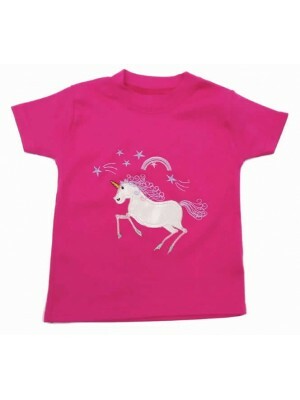 Fabric Content – 100% Cotton T-Shirt Garment Care – Cool machine wash. Avoid ironing applique ..
A soft cotton pale pink t-shirt with a beautiful unicorn applique on the front. 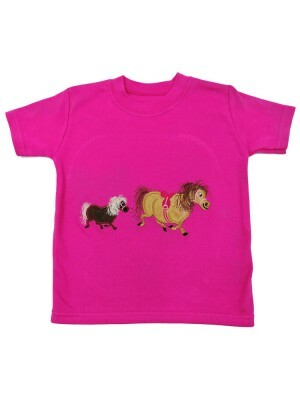 Fabric Content – 100% Cotton T-Shirt Garment Care - Cool machine wash. Avoid ironing applique ..
A soft cotton t-shirt featuring a happy trotting ponies on the front. 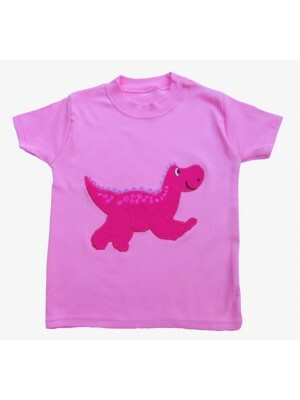 Fabric Content – 100% Cotton T-Shirt Garment Care – Cool machine wash. Avoid ironing applique ..
A pretty pink cotton t-shirt with a lovely friendly appliqued dinosaur on the front. 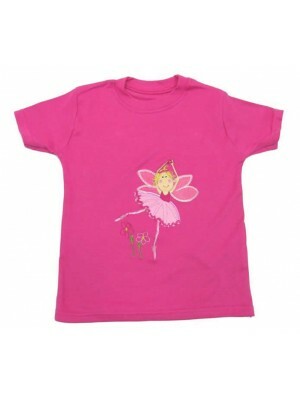 Fabric Content – 100% Cotton T-Shirt Garment Care – Cool machine wash. Avoid ironing applique ..
A cerise t-shirt with a beautiful fairy applique on the front. 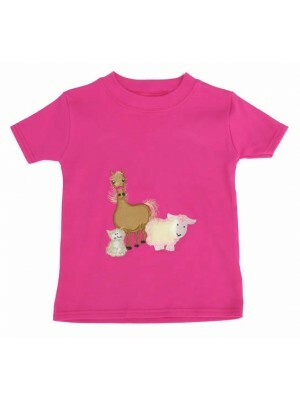 Fabric Content – 100% Cotton T-Shirt Garment Care - Cool machine wash. Avoid ironing applique ..
A soft cotton short sleeved t-shirt featuring a cute farmyard gathering motif with a fluffy sheep. 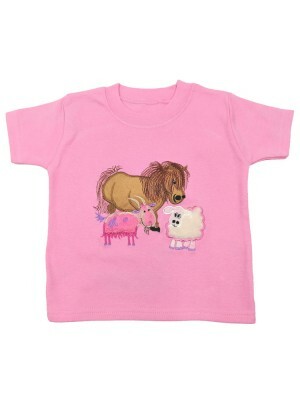 Fabric Content – 100% Cotton T-Shirt Garment Care - Cool machine wash. Avoid ironing applique ..
A perfect summer t-shirt in a bright cerise with 3 cute farmyard animals on the front. 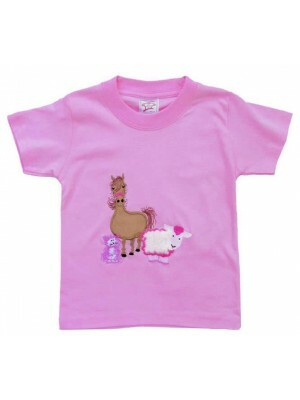 Fabric Content – 100% Cotton T-Shirt Garment Care - Cool machine wash. Avoid ironing applique ..
A lovely soft cotton t-shirt with a happy farmyard gathering stitched applique on the front. 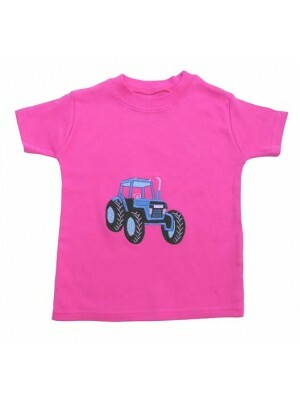 Fabric Content – 100% Cotton T-Shirt Garment Care – Cool machine wash. Avoid ironing applique ..
A lovely cerise cotton t-shirt great for any tractor loving girl. Fabric Content – 100% Cotton T-Shirt Garment Care – Cool machine wash. Avoid ironing applique ..
A lovely pink t-shirt 3 colourful owls on the front. 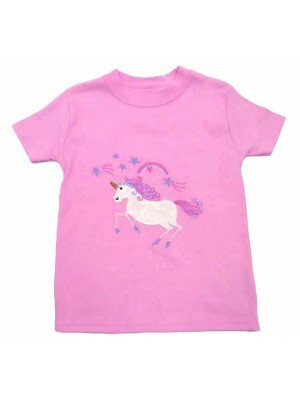 Fabric Content – 100% Cotton T-Shirt Garment Care – Cool machine wash. Avoid ironing applique ..
A cotton t-shirt with a beautiful unicorn on the front. 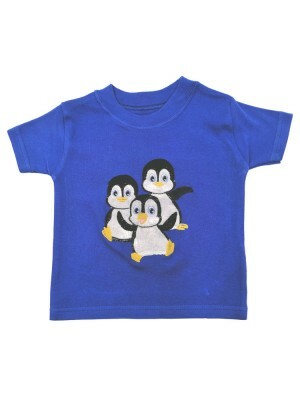 Fabric Content – 100% Cotton Garment Care – Cool machine wash ..